Hi all! I'm Lisa of Stubbornly Crafty. I'm excited to be hanging out today and showing you how to do something I love: appliqué. I’m a big fan of detail. 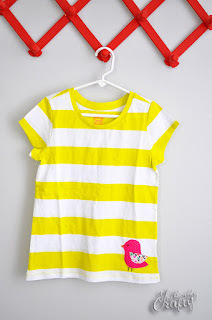 A little added detail can take any piece up a notch in the Awesome Department. Today I’m going to do a quick tutorial on one of my favorite ways to add a little extra personality and detail to a plain shirt or any sewn project. 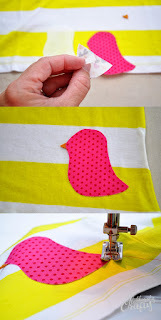 For this tutorial I’ve made a simple bird pattern for us to use. You can download it here. Let’s get started. 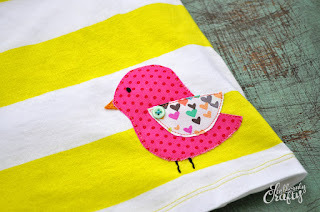 For this bird appliqué, you’ll need to print out the pattern and cut the pieces out, three different fabric scraps, some thread, scissors, a pen, Wonder Under (I prefer #805R, I purchased it at Joann’s), a sewing machine, and an iron/ironing board. 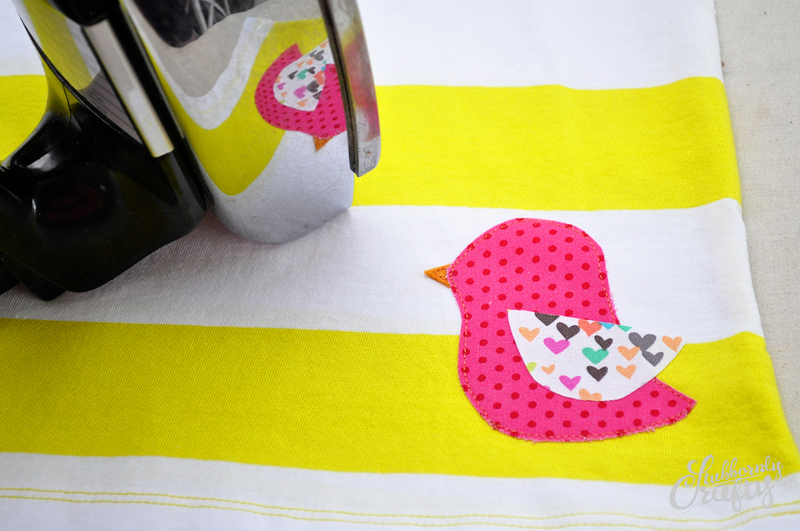 I’ve also used embroidery thread and a teeny tiny button for even more fabulous detail. Trace your pattern on the smooth side of your Wonder Under. 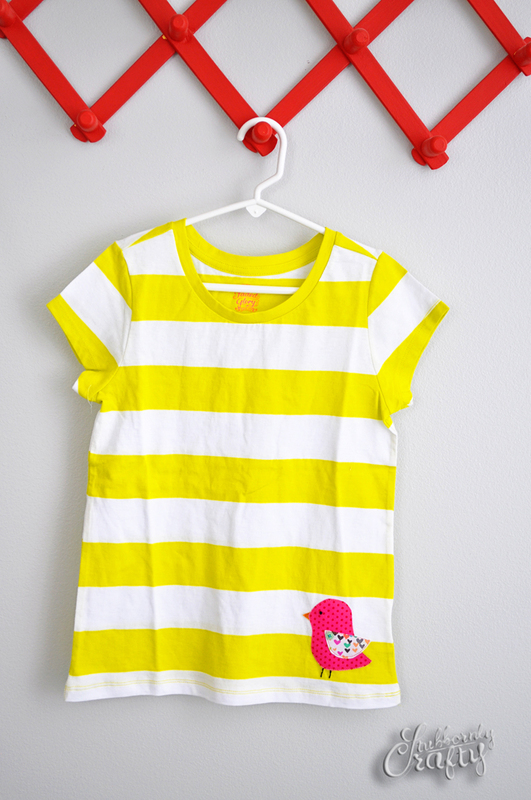 Place your pattern in the opposite direction you’d like your bird to face. 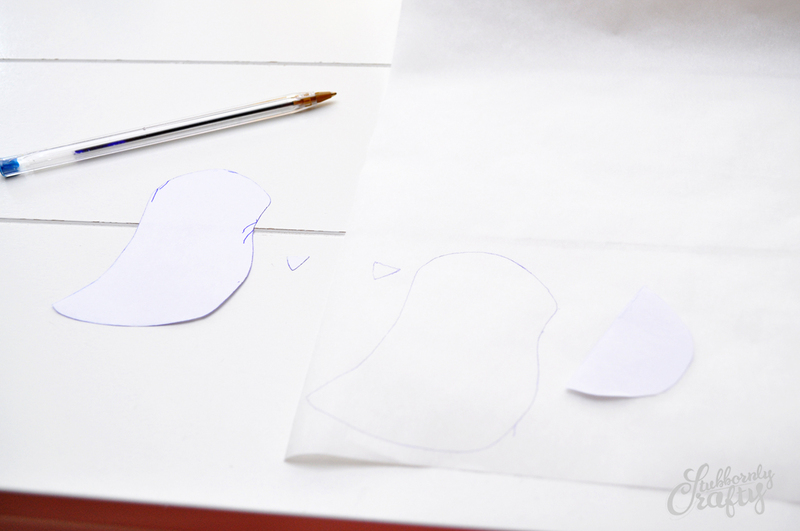 If you want your bird facing to the left on your garment, face the bird pattern to the right when tracing it. 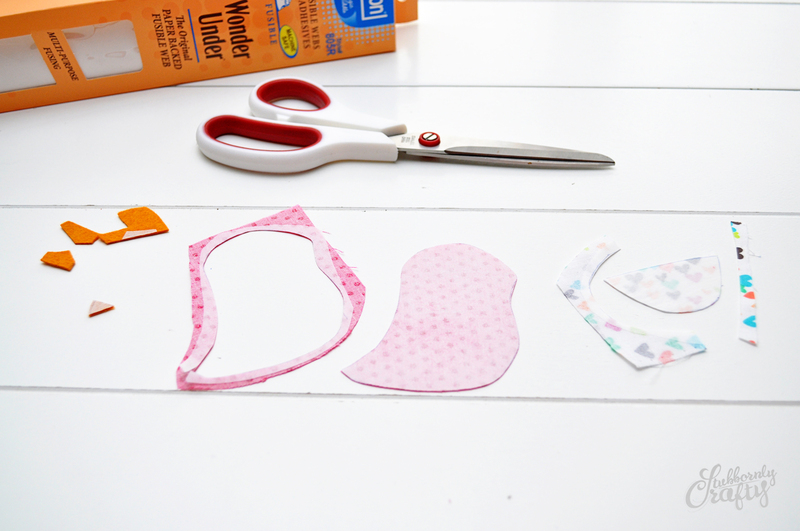 Cut out your pieces on the Wonder Under, leaving a bit extra seam allowance around the sides of your pieces. 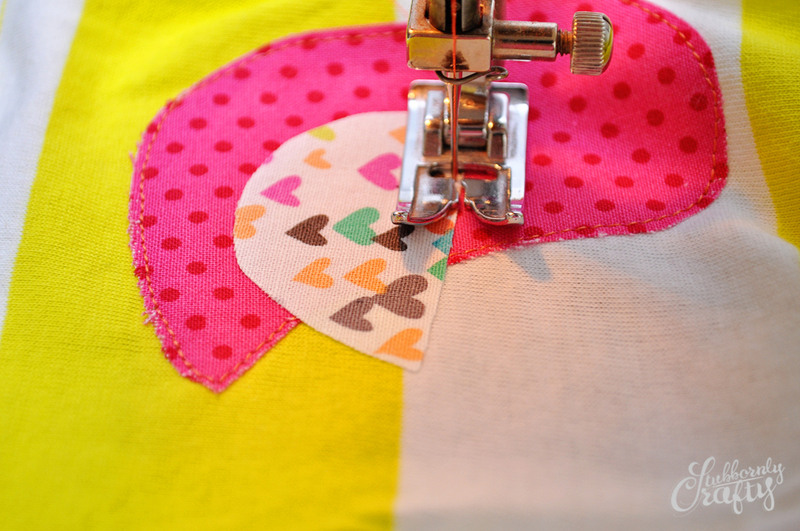 I find it easier when taking off the backing if you leave a bit of extra. Iron your fabric scraps and place them on your ironing board right sides down. Now place your Wonder Under pieces on top of your fabric scraps smooth sides up and iron down according to the direction on the back of your Wonder Under box (all brands have a different amount of time to iron). 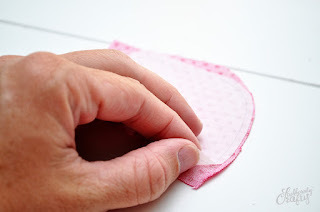 Once you’ve ironed it down, I like to peel up a little corner before cutting out around my shape to make peeling the backing off easier. 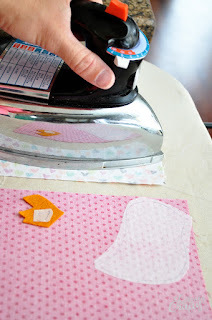 You can also use a straight pin to gently scratch the back of the paper to peel it off from the center out. 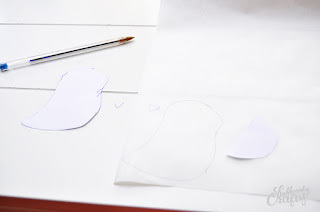 Peel the backing paper off of your shapes. 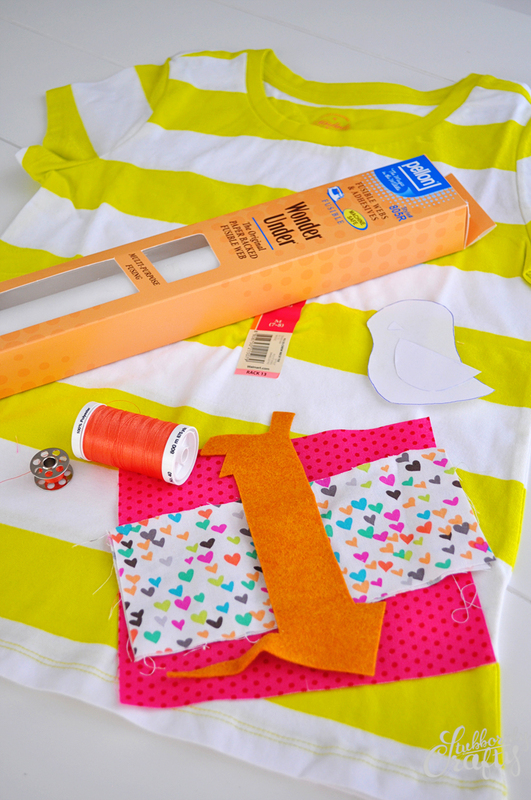 Lay your shirt out and decide where you'd like your appliqué to be. First, lay down your beak and then slightly overlap the bird’s body on top of the beak (right sides up) and press with your iron. 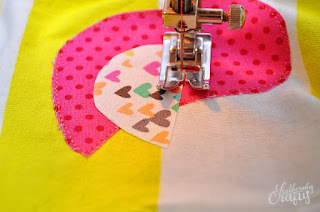 Sew around the perimeter, starting and stopping in the same place. 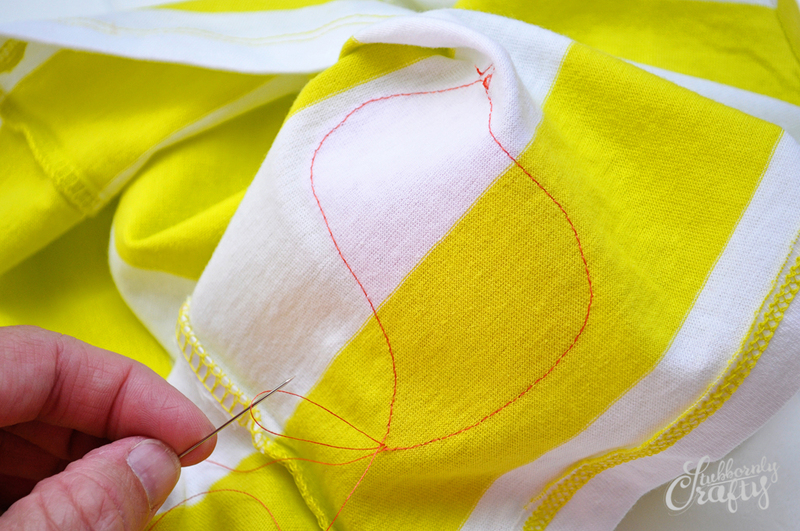 Do not backstitch. Pull the top threads through to the back and tie in a knot to secure. Next, place your wing on top and iron in place. Sew around the perimeter of your wing. Pull the top threads in through the back and tie a knot to secure. Add an eye and legs and whatever other fun details you can come up with. I used embroidery thread and did a french knot for the eye and a back stitch for the legs. And you are done! So simple and addicting.